An unexploded World War Two bomb has been found in the Bristol Channel off Hinkley Point. It is the third to be found there this month. The coast was once used as part of a practice bombing range for the Royal Navy. All vessels in the area are advised to proceed with caution. There is currently a 1,000m exclusion zone. The 250 pound explosive is set to be examined and detonated later this afternoon, Wednesday 30 August. A new exhibition opens this weekend telling the story of Hinkley Point over thousands of years. The Landscapes of Power exhibition at the Museum of Somerset in Taunton features artefacts and specially commissioned artwork, as part of the county's largest archaeological project. Researchers have found the area has a rich history. Four anti-nuclear protesters who chained themselves together outside Hinkley Point nuclear power station are due before magistrates in Taunton, charged with obstructing a highway. The action last month was in protest at plans for new reactors at the site near Bridgwater. The main access road was blocked, causing long queues as staff arrived for work. A Government spokesman has said that ministers are close to signing a deal for the proposed new nuclear reactor at Hinkley Point. 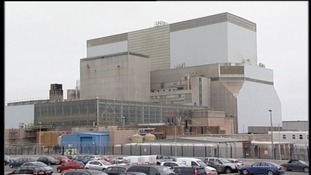 Lord Marland said a planning application for the new reactor would be ready by December. Energy company EDF said construction work would create 25,000 jobs. Plans to build a nuclear power station at Hinkley point in Somerset will be discussed by councillors later. Sedgemoor distict councils Local Impact Report is expected to show the positive and negative effects of the proposed site. Green Party leader: "nuclear power is unsafe"
Green Party leader Caroline Lucas MP gives her views on the controversial plans for a nuclear power station at Hinkley Point ahead of a planned protest this weekend. Peter Higginson from EDF Energy says they respect the right of people to protest ahead of a planned demonstration this weekend against the proposed Hinkley power station.